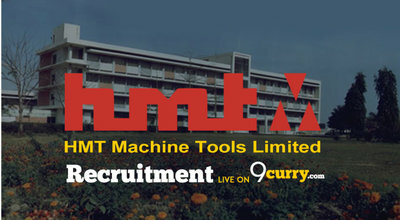 HMT Machine Tools Limited Recruitment 2019: HMT Machine Tools Limited / www.hmtmachinetools.com is conducting recruitment processes to fill 1 vacancy. As of now, there is one recruitment drive going on for Ex. Associate D’ PS-V Post. HMT Machine Tools Limited Recruitment 2019 - Job notification for Ex. Associate D’ PS-V Post in HMT Machine Tools Limited, Pinjore, Haryana on Contract Basis. Applications are invited by HMT Machine Tools Limited on or before 19 Apr 2019 for 1 vacancy. HMT Machine Tools Limited Recruitment 2019 - Walk in for 14 Graduates Posts in HMT Machine Tools Limited, Kalamassery, Kerala. Candidates are invited by HMT Machine Tools Limited to attend walk-in-interview to be held on 08 Mar 2019 10:00 AM for 14 vacancies. HMT Machine Tools Limited Recruitment 2019 - walk in For Ex Associates Posts in HMT Machine Tools Limited, Pinjore on Contract Basis. Candidates are invited by HMT Machine Tools Limited to attend walk-in-interview to be held on 12 Apr 2019 02:00 PM for 3 vacancies. HMT Machine Tools Limited Recruitment 2019 - Job notification for Jr. Associate Post in HMT Machine Tools Limited, Pinjore, Haryana on Contract Basis. Applications are invited by HMT Machine Tools Limited on or before 26 Mar 2019 till 10:00 AM and Interview held from 02:00 PM on the same day for 1 vacancy. HMT Machine Tools Limited Recruitment 2019 - Job notification for Security Guard Post in HMT Machine Tools Limited, Pinjore, Haryana on Contract Basis. Applications are invited by HMT Machine Tools Limited on or before 25 Mar 2019 and Interview to be held on 26 Mar 2019 at 10:00 AM for 1 vacancy. HMT Machine Tools Limited Recruitment 2019 - Job notification for Executive Legal Post in HMT Machine Tools Limited, Pinjore, Haryana on Contract Basis. Applications are invited by HMT Machine Tools Limited on or before 25 Mar 2019 and Interview to be held on 26 Mar 2019 at 10:00 AM for 1 vacancy. HMT Machine Tools Limited Recruitment 2019 - Job notification for Executive Associate E Post in HMT Machine Tools Limited, Kalamassery, Kerala. Applications are invited by HMT Machine Tools Limited on or before 05 Mar 2019 for 1 vacancy. HMT Machine Tools Limited Recruitment 2019 - Walk in for Project Associates Posts in HMT Machine Tools Limited, Kalamassery, Kerala. Candidates are invited by HMT Machine Tools Limited to attend walk-in-interview to be held on 09 Mar 2019 09:00 AM for 6 vacancies. HMT Machine Tools Limited Recruitment 2019 - Job notification for Executive Associate & Jr Associate Posts in HMT Machine Tools Limited, Kerala on Contract Basis. Applications are invited by HMT Machine Tools Limited on or before 19 Jan 2019 for 2 vacancies. HMT Machine Tools Limited Recruitment 2018 - Executive Technical – B Posts in HMT Machine Tools Limited, Ajmer, Rajasthan on Contract Basis. Candidates are invited by HMT Machine Tools Limited to attend walk-in-interview to be held on 03 Jan 2019 09:30 AM for 5 vacancies.